Human beings have only very recently recognized the destruction modern life has waged on the planet, and collectively we’ve done a lot to mitigate those effects. However, some people want to go the extra mile, equipping their humble abode with all the modern features of energy-efficient homes. Consider the following designs which will reduce your house’s ecological footprint and give a little life back to the planet. This technique employs less lumber to build the framing of the house, saving energy by minimizing the use of wood and insulation. The result is a sturdy structure that allows you to save on labor costs and material. Material cost savings can be up to $1,000 with an additional 5% savings on annual cooling and heating bills. The Department of Energy recommends cool roofs—their design allows them to reflect rather than absorb sunlight via greatly reflective paint. A cool roof can stay up to 50°F cooler than roofs under similar conditions without this reflective coating. Cool roofs typically have a longer life span than non-efficient roofs and can reduce energy bills as it circulates the coolness from the roof throughout the home. A truly energy efficient home owes much of its prosperity to insulation with high R-values. The R-value in terms of insulation refers to its ability to resist heat transfer—the higher the value, the better it retains heat. A typical house might have an R-value of R-11 in the walls, while a properly constructed and well-thought-out home would have a value of R-30. Installing solar panels in a home is becoming a more popular option as the technology becomes cheaper. 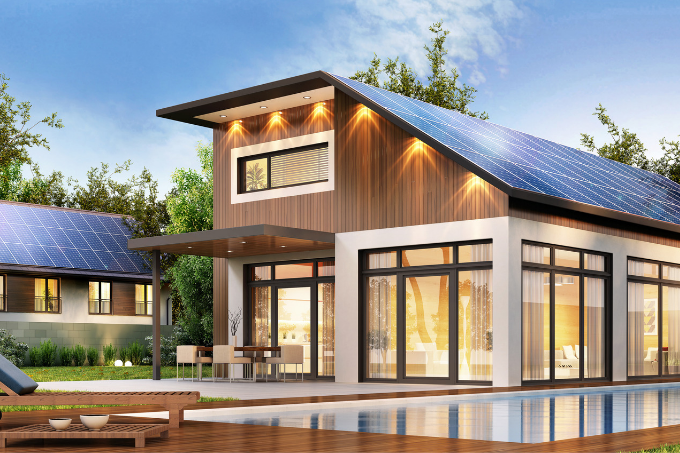 However, cheaper certainly does not mean affordable; outfitting your whole home with solar panels (depending on the size) costs an average $11,214 to $14,406. The amount of energy produced by these solar panels varies with the amount of sunlight that hits its surface, but statistics show that a single solar panel can produce 500-550 kilowatt-hours of energy in a year. All energy-star products meet energy efficiency regulations set by the Environmental Protection Agency. These appliances use 10-50% less energy than other appliances and reduce greenhouse gas emissions. They can also significantly reduce your electric bills. In the average house, the appliances that use up most of the electricity are the washer and dryer, refrigerator, and central heating and cooling system.